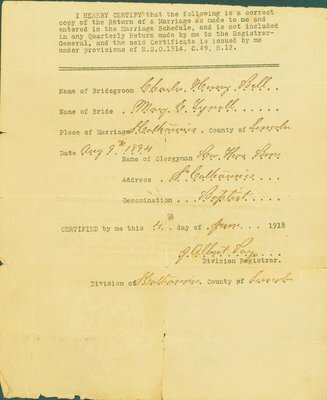 A marriage certificate for Charles Henry Bell and Mary E. Tyrrell dated August 9, 1894 in St. Catharines, Ontario. The certificate is signed by Rev. Thos. Bones, Baptist Minister, and certified by J. Albert Pay, Division Registrar, for the Division of St. Catharines in the County of Lincoln. This certificate was among the family memorabilia in the possession of Iris Sloman Bell, of St. Catharines. The Sloman - Bell families are descended from former American slaves who later settled in southern Ontario. There are various spellings of the Tyrrell name within the Bell family archive. Other forms of the name include Tyrell, Tyrrill, and Terrell. RG 63 Rick Bell Family fonds, Brock University Archives, Brock University.